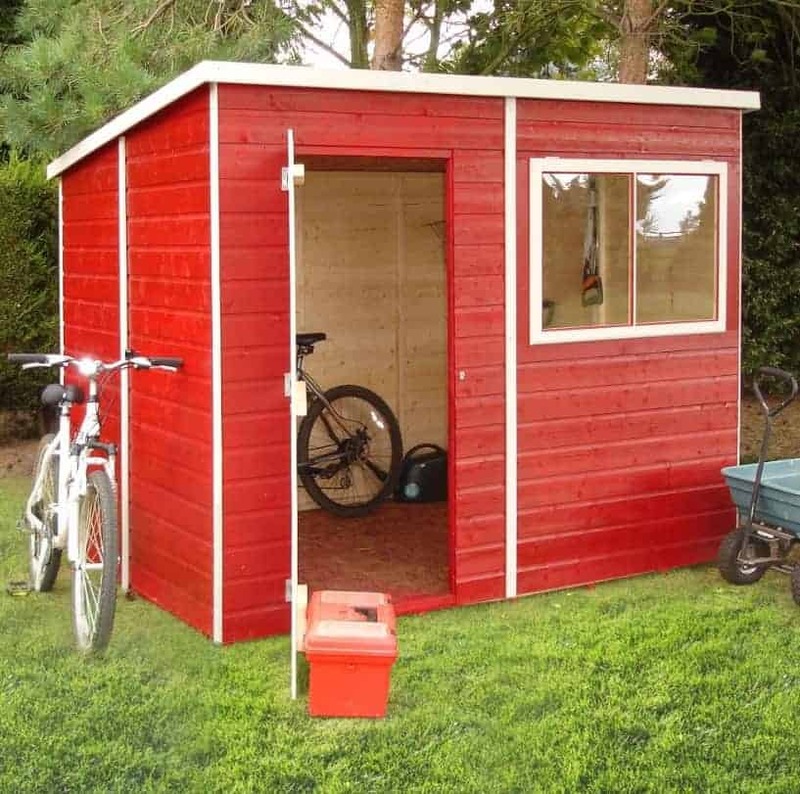 Garden Storage Shed - Who Has The Best Garden Storage Shed? It not only provides a safe and secure place for you to store gardening tools and equipment, and more, it can also add to the visual appeal of your garden as a whole. With so many varieties of storage sheds to choose from, how do you choose the one that’s just right for you? Help is at hand, with this WhatShed guide to help you find your perfect garden storage shed. We then ranked them according to many factors such as price and value for money, visual appeal, durability, and value adding features such as extended warranties. Our first task when compiling this league table was defining just what a garden storage shed is. We decided that all sheds featured here have to be designed with storage purposes in mind, which is why we’ve used a maximum base area of eight foot by eight foot, thus discounting larger workshops and log cabins. 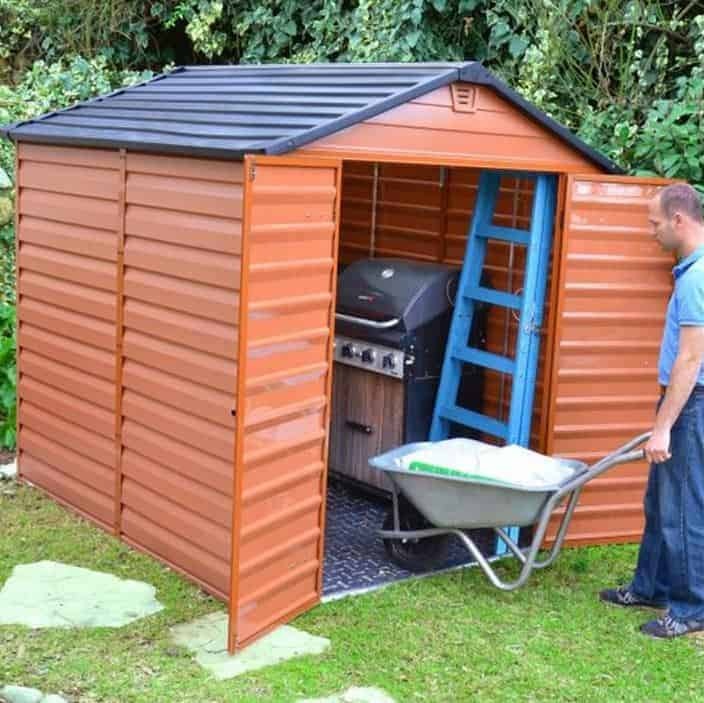 They also have to be sheds designed to be positioned upon the garden, so we have also ruled out lean-to and corner sheds. With such a large range of sheds to choose from, made of wood, plastic and metal, selecting our overall champion was a difficult task. 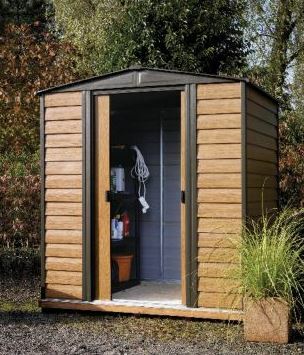 It’s well done then to the eight foot by six foot Ultimate tongue and groove shed, which thanks to its good looks, long warranty period, toughness and durability is named the best garden storage shed that can be bought online in the UK today. From sheds to greenhouses, the independent reviews from WhatShed can help you find your ideal garden building. 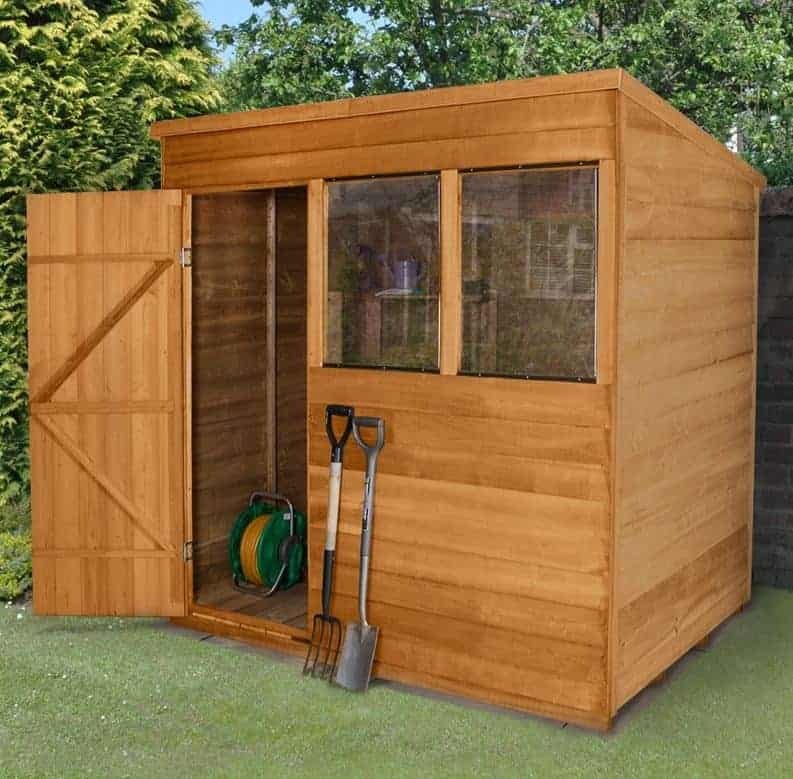 This tongue and groove garden storage shed is far from the cheapest on our list, yet we still feel that it represents good value for money when its visual appeal, durability, and storage capacity have been taken into consideration. 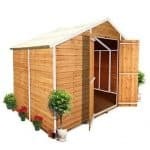 With a base area of approximately eight foot by six foot this is also one of the larger storage sheds in our list, which makes it suitable for those with larger gardens as well as those who want a storage facility that’s also large enough to spend time inside, or to utilise for a hobby such as carpentry. We were struck by its good looks from the moment we saw it, thanks to its smooth planed timber and the addition of two windows on a side panel. We know that many people prefer the look of wooden sheds, and whilst this will certainly appeal to them it also appeals to us enough to gain the top spot in our league table. What impressed us most about this garden storage shed, and which is largely responsible for its lofty position, is that it’s not only very good looking, it’s very tough as well. The strong tongue and groove timber and frame make this strong and stable once assembled. We were also pleased to find that the timber has been pressure treated by the manufacturer, bringing with it a 15 year guarantee against rot. A further additional feature that we welcomed is the use of toughened glass, as it’s something we rarely see in sheds of this size and price. 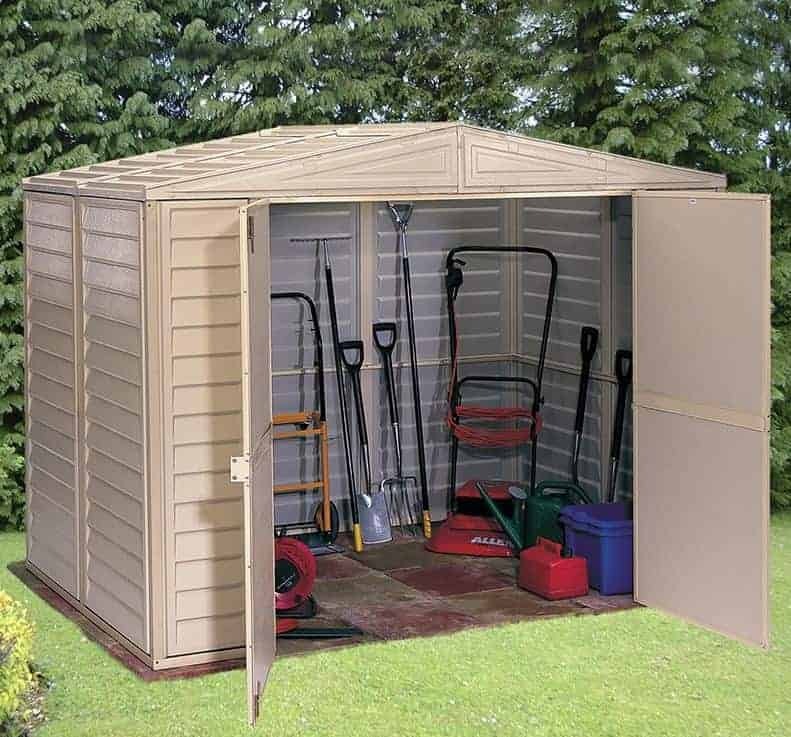 One of the great things about a garden storage shed, is that they are available in all substrates: wood, metal and plastic. This means there’s one to suit all tastes and all circumstances. 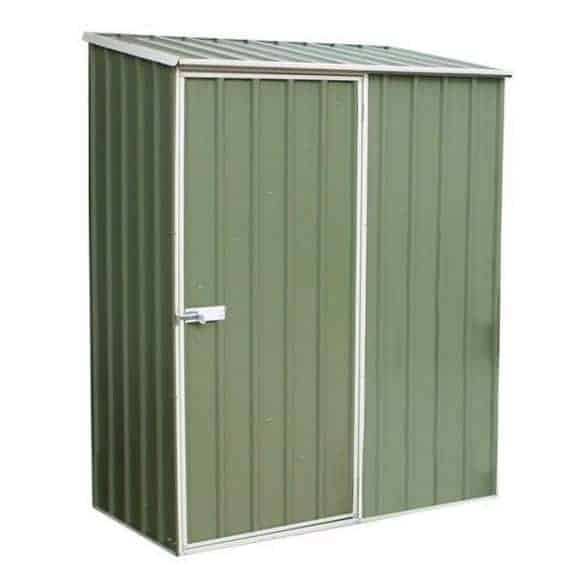 This is the highest placed metal shed in our league table, and it brings with it the natural advantage of being free from the threat of rot, so you won’t have to treat it on an annual basis. It also represents outstanding value for money, particularly as it comes with a 20 year manufacturer’s warranty. That’s as long as any warranty period that we’ve seen on a storage shed, and when its striking and original looks are taken into account as well it was a close contender for the number one spot. What caught our eye instantly when we saw this six foot by five foot garden storage shed is its stunning mountain blue colour scheme. 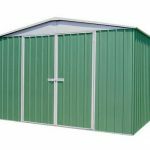 Most metal sheds that we see are either green or a silvery grey in colour, so we were pleased to something that’s both different and yet stylish as well. That makes it an ideal choice for people who like the idea of having something that’s as naturally tough and low maintenance as a metal shed, and yet don’t want anything that looks too metallic in their garden. 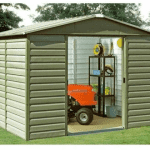 The effectiveness and usefulness of metal clad sheds is shown by the fact that they occupy two of the top three positions in our garden storage shed league table. To add to their innate strength and durability they are also typically cheaper than their wood or plastic counterparts. 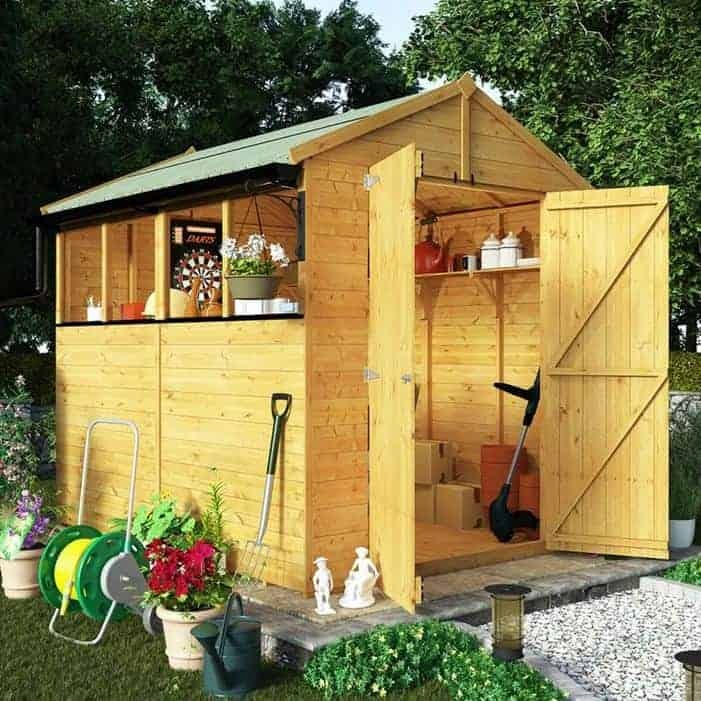 That’s certainly true of this BillyOh shed; it’s the cheapest in the whole of this top twenty list, and we feel its price of only £175 for a six foot by four foot shed represents outstanding value for money. This is added to even further by the inclusion of a 15 year manufacturer’s warranty, and this combination is enough to earn it third place in our WhatShed guide. We were almost as impressed by the looks of this garden storage shed as we were by the price tag attached to it. That’s because whilst we often see green coloured metal sheds, this uses a darker shade of green and it’s applied across the whole of the shed with the only contrast coming by way of the white ventilation panels. It’s very striking, and we feel it should blend in well with a typical garden background. Another useful feature that we were pleased to see was the inclusion of an entrance and exit ramp, making it easy to manoeuvre a wheelbarrow in and out. This is the second BillyOh garden storage shed in a row, but this one is timber clad and a very different shed altogether. What we liked most about is that it offers a unique and very useful security solution. Whilst many of the compact sheds we review have no windows, thus keeping prying eyes away from whatever is stored within, that can make it difficult to store and retrieve items, or it can necessitate the need to add an artificial source of lighting. Not here, as there are windows that allow natural light to enter. Being both small and placed high up on the shed, however, they are still an effective way of ensuring shed privacy and therefore increasing its security. 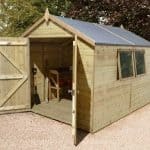 We were again impressed by the excellent value for money provided by this shed, which is something we’ve learned to associate with the BillyOh range in general. Its six foot base area is available for base price of less than two hundred pounds, with a value adding 10 year anti-rot warranty included as well. It has to be noted however that no floor is included at this price, so one will need to be added. This costs just over twenty pounds for an economy floor, however, so we don’t feel it detracts from the overall value provided. This is the first plastic garden storage shed to gain a place inside our top twenty league table, and it offers significant advantages over both wood and metal sheds. For a start, it can’t rot or rust, and it’s immune from attack by rodents, wasps and woodworm. That means that it is in effect maintenance free, aside from an occasional wash or hose down, and this makes it a good choice for people who want a durable garden shed that they can install and then not have to take any more effort over. As this brings savings of both time and money, we feel that the asking price of less than four hundred pounds for this accommodatingly sized six foot by eight foot shed is more than reasonable. We know that many people prefer the traditional appearance of a wooden garden storage shed, and would be put off by the thought of having something too obviously plastic looking in their garden. This Palram shed could still appeal, however, thanks to an amber colour scheme that creates a wood like effect when viewed from a distance. Another thing we liked about this shed was the inclusion of a skylight, allowing natural light to enter in from above while shielding the shed’s contents from passers by. This is the smallest garden storage shed to gain a position inside our top twenty league table, with its base size of approximately five foot by three foot. This in itself can be an advantage, however, to those people who want the advantages that a well built storage shed can bring and yet don’t have a lot of lawn space available on which to situate it. As it has a pent rather than apex roof it also has a less obtrusive look, and it may be possible to hide it behind a fence or wall thus boosting its security. Whilst it is relatively small, this garden storage shed is among the very toughest that we’ve seen, and it’s this that helps it gain a place within the top half of our league table. That’s not only because it’s fabricated from a high grade steel that’s thicker than we usually see, but because the Australian manufacturer behind these sheds has built them to withstand winds in excess of ninety miles per hour. If you live in a windy or exposed area this could be the shed for you, especially as it comes with a 20 year guarantee as well. We were also very impressed with the SnapTite assembly system that is unique to this range of sheds. It means that the panels simply snap into place along a frame, making installation easy even for those who have never installed a metal shed before. 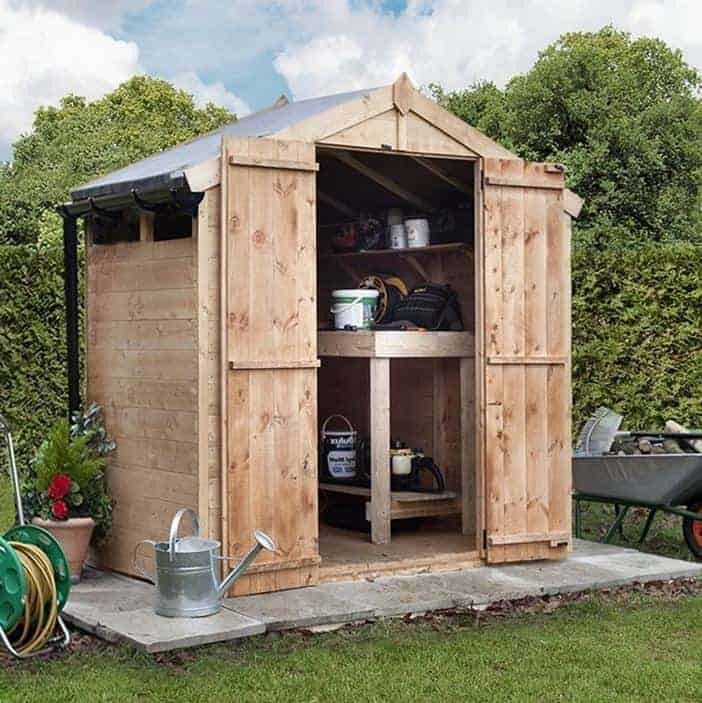 This shed has a lot in common with our table topping garden storage shed, including a sizeable and very useful eight foot by six foot storage area, and a traditional wooden design underneath an apex roof. Even more importantly, it also shares an initial pressure treatment. It’s something that we always like to see on wooden sheds as it brings with it a 15 year guarantee without the need for annual retreatments to be undertaken. On this occasion, however, overlap cladding has been used rather than thicker and stronger tongue and groove cladding. This has been taken into account when determining its position inside our league table, but it also means that it comes at a very affordable price of just over three hundred pounds. One other advantage brought by the overlap cladding on this garden storage shed is that it creates a very rustic appearance that we know shed traditionalists will especially appreciate. Another thing that stood out for us was the height of this shed, with its peak height of 2.14m greater than we see on many of the mid sized timber sheds we review. We were also pleased to see that the roof itself was made of onduline. This is a very weather resistant material, but also very lightweight so it’s relatively easy to install. We now have another overlap clad garden storage shed, and whilst we generally prefer the reliability and resilience of a shiplap or tongue and groove shed this again shows the advantages that an overlap shed can bring. Its rustic style catches the eye even in its bare form, but it also means that it’s much easier to paint or stain than smooth planed timber. 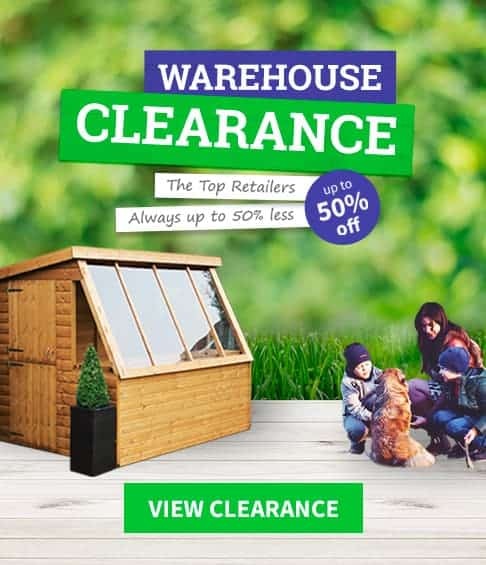 Even more importantly it brings with it a great value price tag of not much more than two hundred pounds, which is much less than we’d usually expect to see attached to a seven foot by five foot wooden shed with a 15 year anti-rot guarantee supplied by the manufacturer. One reason that the manufacturer of this garden storage shed has been able to offer such a long guarantee with it, is that it has been given an initial pressure treatment. That brings long lasting protection against rot and against insect attack as well, which is something we always like to see but don’t usually expect to see in a shed that’s as affordable as this one. It also means that the owner is freed from the onerous task of having to add their own coats of wood preserver every year, which is something that we often find required on garden buildings that are much more expensive than this one. 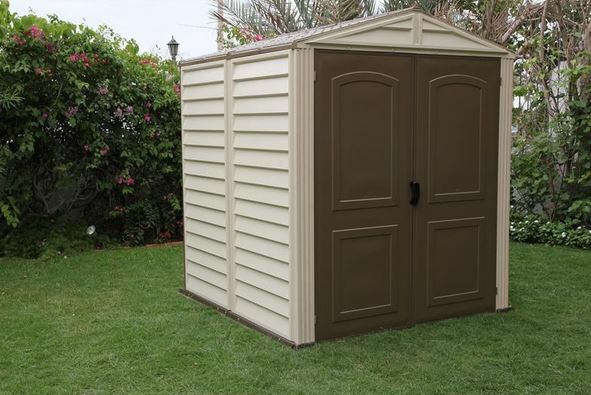 If you worry that a plastic clad garden storage shed may look a little bland or even cheap, then we recommend that you take a look at this six foot by six foot model from Keter. It takes its inspiration from wooden sheds both in its shape and detail. The square shed has a a square base with a slightly pitched apex roof over the top of it to carry rainwater away. What most caught our eye, however, was the white and grey coloured cladding which has been given a woodgrain effect; we found that it created a look that’s very contemporary and at the same time traditional. This is probably the best illuminated plastic garden storage shed that we’ve reviewed, as not only does it incorporate a small square window on a side panel, it also has a skylight in the roof. This means that there’s a more than adequate supply of natural light reaching the interior, which is good news for people who want to use it as a place to work or pursue a hobby as well as for storage purposes. We also found it reassuringly tough and stable once assembled, as the polypropylene cladding has been given a steel reinforcement that brings with it a 10 year guarantee. One of the advantages of a pent roofed garden shed such as this is that they are much less obtrusive than a typical apex roofed shed, meaning that they won’t detract from the appearance of the garden itself, and also that they can be positioned away from the gaze of passers by and potential thieves. It also means that this seven foot by five foot shed may be able to be positioned underneath overhanging branches, allowing the owner to site it in places that would be inaccessible for an apex shed. Whilst it has overlap rather than tongue and groove cladding, we still found this to be a visually pleasing garden storage shed, thanks to the use of a single hinged door on the left hand side which then has two styrene windows alongside it. Whilst we would have preferred tongue and groove cladding, and toughened glass rather than styrene, these are very cost effective options and we were pleased to find that these cost savings seem to have been passed on to the customer. 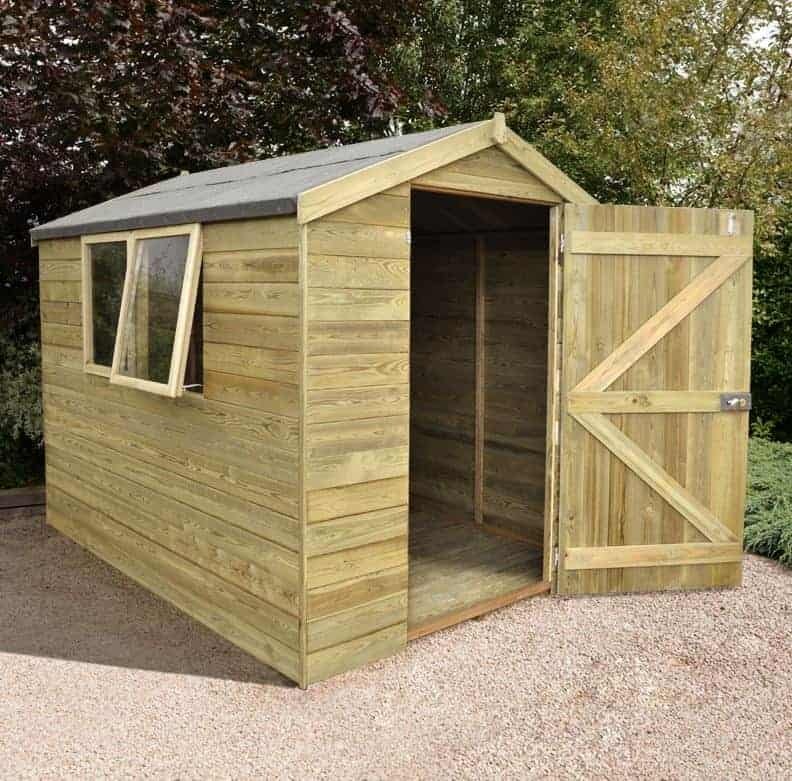 Its asking price of not much more than two hundred pounds, with a 10 year guarantee included as well, represents very good value, and it’s this that earns this shed the final position inside our top ten. We always like to see a garden storage shed that is well built and yet has a look all of its very own, which is why this Aero shed gains a place inside our WhatShed league table. We were immediately struck by the very modern, almost futuristic look of this shed, and yet it’s very practical too. That’s because the roof isn’t arranged in a straight pitch, as we would expect to see in a pent shed for example, but in a smooth and eye catching curve. It quickly carries rainwater away, and its overhang also creates a shaded and weather protected area outside of the single hinged door. The other design feature that really stood out with this garden storage shed is the two long and thin windows on either side, meaning that the interior is very well illuminated when the sun is shining. We were also pleased to see that high quality tongue and groove cladding had been used for the timber, and that this brought with it a 10 year guarantee against rot as well. 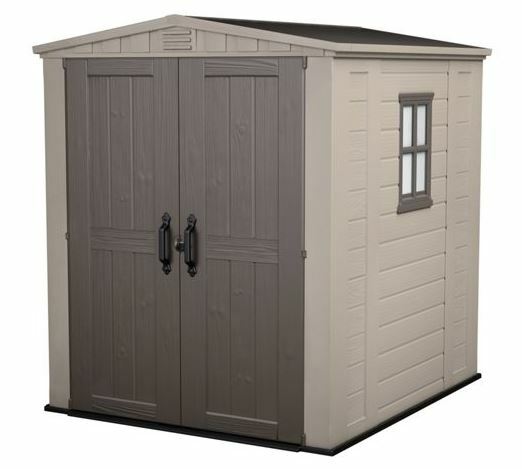 It is a little more expensive than some sheds we see of a similar price however, and this stops it from rising even higher in our league table of the UK’s best garden storage sheds that can be bought online right now. 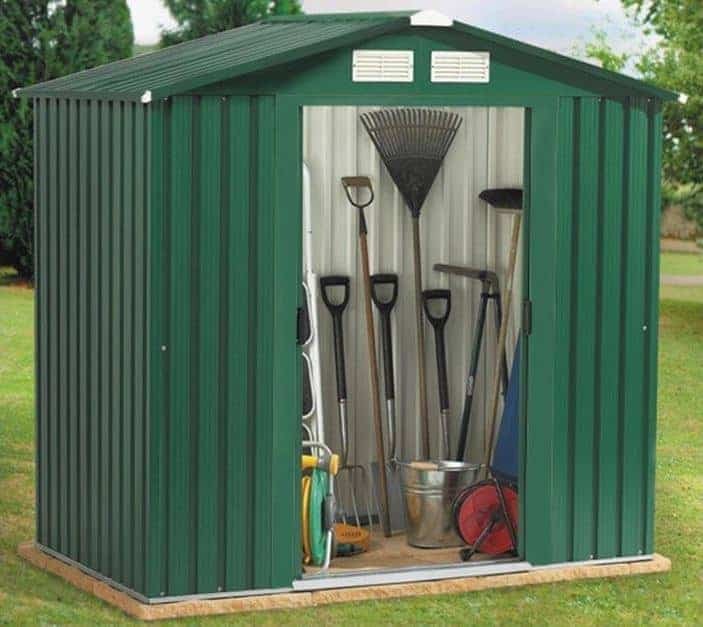 As we’ve already seen in this WhatShed league table, a metal garden storage shed can produce a lot of benefits when compared to a wooden shed, primarily that they typically need much less maintenance and are also easier to install. 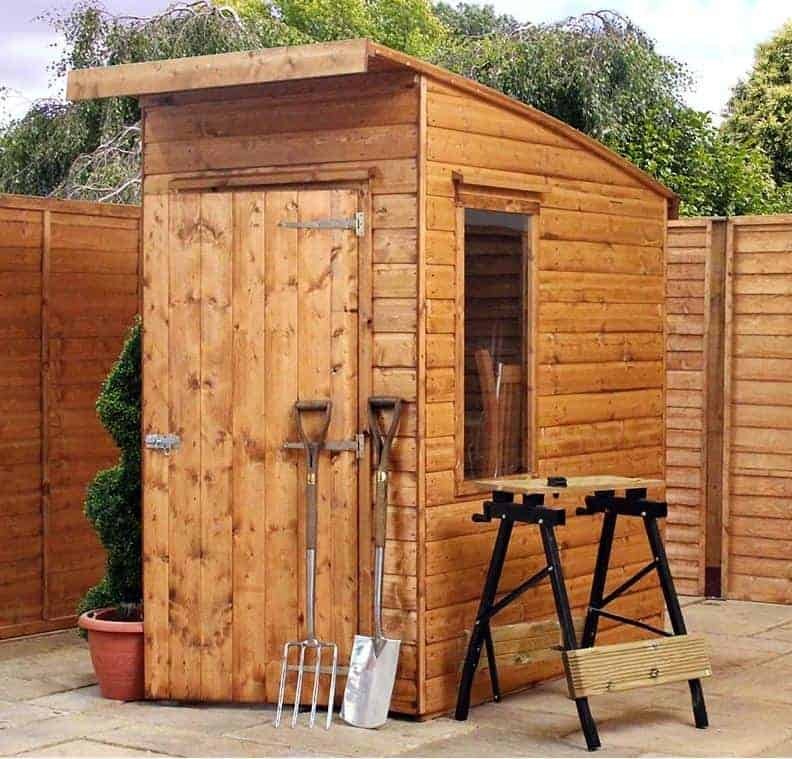 We know that some people are still put off by the thought of having something metallic looking in their garden, however, but this Woodvale shed could allay their concerns. We really liked its coffee coloured cladding with dark chocolate brown detailing, and the overlap style arrangement of the metal panels also helps to emphasise the timber like appearance. The base area of approximately six foot by five foot provided by this garden storage shed puts it very much in the middle of the sheds featured here. We feel that these are very useful dimensions as it allows for the storage of a good amount of tools and equipment, and maybe even a lawn mower, without taking up too much lawn space. We also liked the smooth opening double sliding doors, as they make it very easy to gain access to the shed whilst carrying heavy or bulky items such as bags of soil or sand. It was also good to see that the door handles were holed and ready to accept a padlock, an easy way to add extra security. An apex roof is both a traditional and practical way to top a garden storage shed, as it creates extra headroom and vertical storage space inside the shed, and also ensures that rain or snow is quickly swept away. This exciting looking shed, however, retains the practicality while swapping the traditional for something more modern looking. It does this by having an offset apex roof, which means that the ridge of the roof, which comes in at a height of 2.15m, is far more towards the left hand side of the shed than the right. It caught our eye from the moment we saw it, and we feel that this is one timber shed that could easily become a talked about garden feature in its own right. We were equally impressed by the high quality of components used in this seven foot by seven foot garden storage shed, as represented by the shiplap cladding used for the walls. It locks tightly together, thus keeping rainwater out and the contents within dry, and it also creates a smooth and pleasing appearance. Once assembled it feels both strong and stable, and so it could be a good choice for areas that are sometimes affected by strong winds. We were also pleased to see that extra reassurance is provided to the consumer by a 10 year guarantee. With its base area of almost eight foot by eight foot, this is the largest garden storage shed to gain a place inside our top twenty league table. This brings with it obvious advantages for those who have enough garden space on which to position it. Whilst it can be used for relatively large scale storage purposes, it could also be used as a workshop for either business or leisure purposes, although as it features no windows for security reasons an artificial source of lighting would need to be installed if the owner plans to work inside it. As the plastic cladding is also fire resistant, we can imagine it being used as an all weather store for motorcycles or ride on lawnmowers. 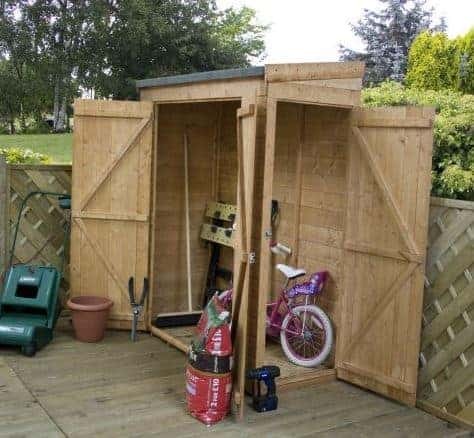 This may not be the most attractive or intricately garden storage shed that we’ve seen, but we feel that it has a contemporary look that should fit in well with gardens that already have white PVC structures in them. It’s also a very tough shed, and as it’s immune from concerns about rot or rust we wouldn’t be surprised to see it last far longer than the 10 year manufacturer’s warranty suggests. Only the relatively high asking price stops this plastic shed gaining a place in the upper half of our league table. A very traditional looking garden storage shed such as this will always appeal to us, especially as it has the build quality and durability that we’ve come to associate with the BillyOh range of timber sheds. The thing that immediately caught our eye about this eight foot by six foot was the bank of window that run across the full length of one side. 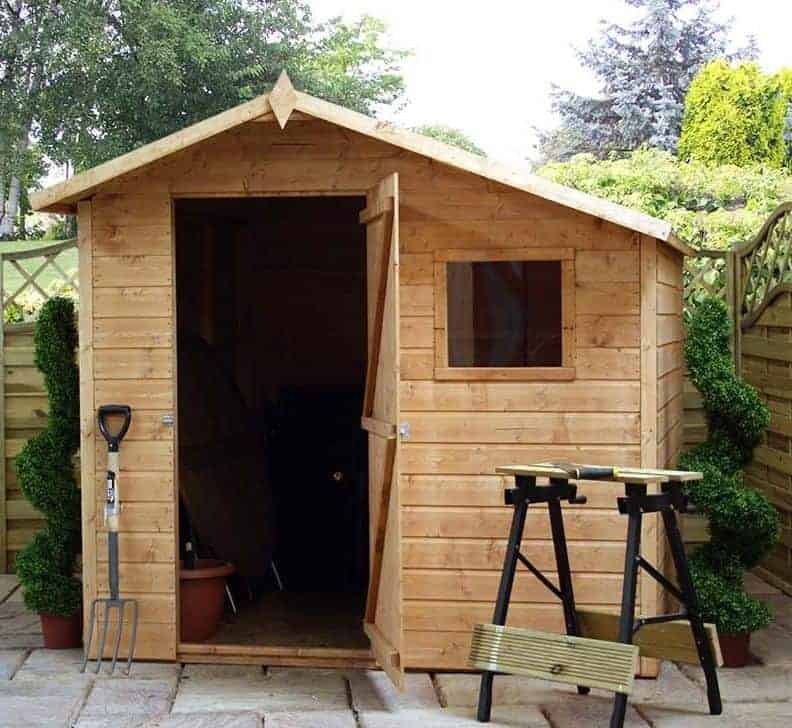 This makes it one of the brightest and therefore most welcoming wooden sheds of this size that we’ve seen, so whether you’re working in this shed or retrieving items from it, you’ll have plenty of light to help you. The second thing to catch our attention was just how tall it is, with its felt covered apex roof reaching a peak height of 2.22m, or well over seven foot. This extra space can be utilised to the full with the addition of some stand alone shelving units, and of course it’s also welcome news for shed owners who are a little taller than average, meaning that they won’t have to stoop too much when entering through the wooden doors. 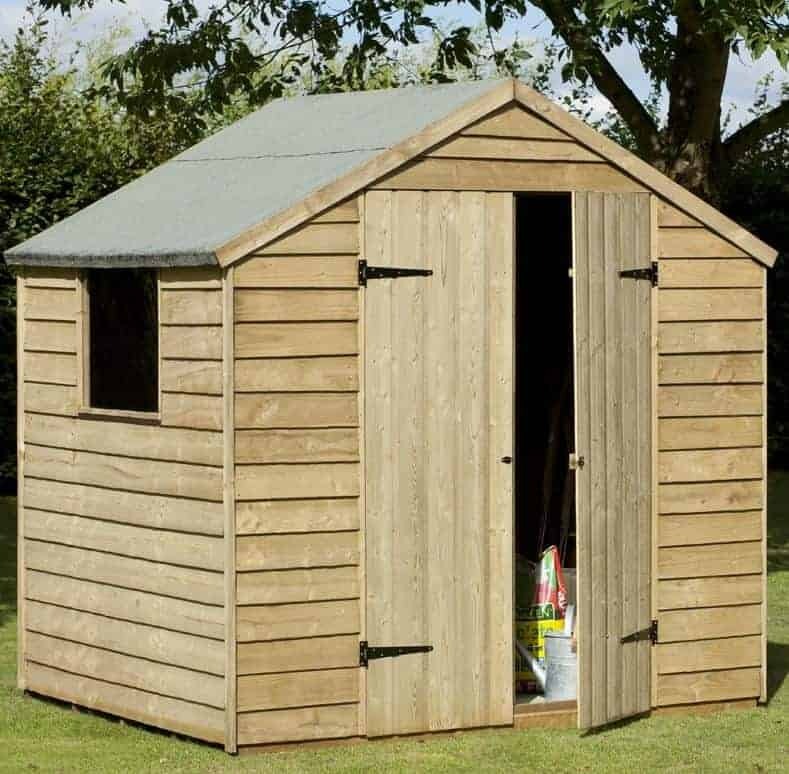 This shed also comes with a 10 year warranty, and if it had also come with an integrated floor, and had been just a little cheaper, then it could have enjoyed an even higher ranking in our league table. 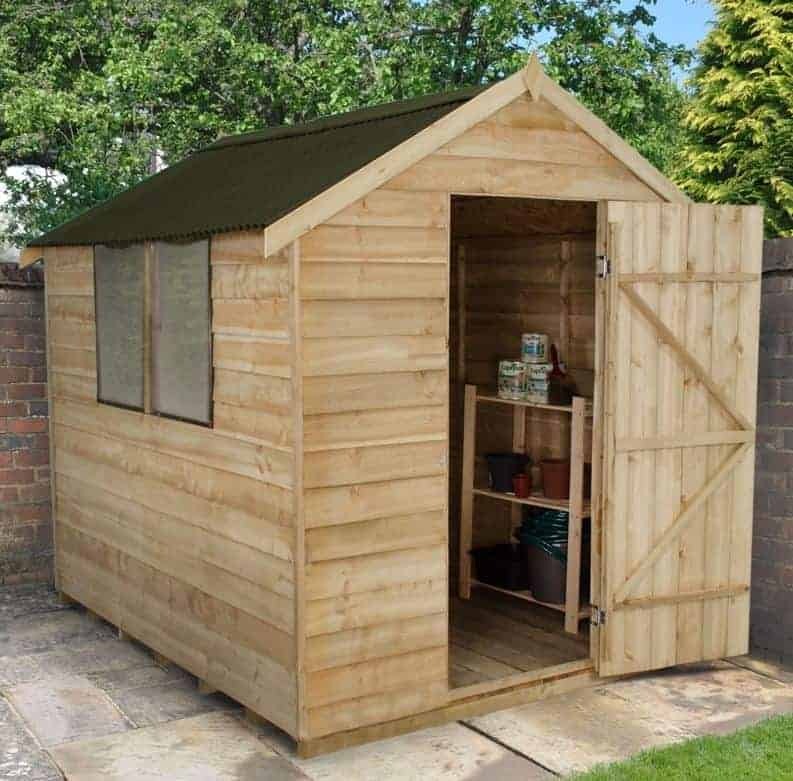 If you’re one of the many people who like the traditional appearance of a mid sized pent shed, then this six foot by four foot model is certainly one to add to your shortlist. It caught our eye from the moment we saw it simply because of its classic design, and the smooth planed timber not only provides excellent protection against the elements it also gives it an instantly recognisable touch of class. Also impressive is the rectangular window alongside the single hinged door, and we were pleased to find that it contained high quality glass rather than styrene glazing that we more usually see in sheds of this size and price. The lower aspect of a pent roofed garden storage shed can make them feel a little cramped at times, but that isn’t so much of a problem here as it will normally be used for short periods of time as the owner simply moves things in and out of storage. It also brings with it added security, in that it can more easily be positioned out of sight of passers by. We would have liked to see an extended warranty included, however, rather than the statutory one year given here, and that accounts for its position on the final quarter of our league table. This plastic clad garden storage shed would be a good choice for a garden that’s shallow, and yet is also relatively wide. That’s because the first thing that caught our eye about it was its reverse apex. It is in fact almost twice as wide as it is deep, with dimensions of 2.13m to 1.16m respectively, which will make it almost uniquely suited to some gardens. We also felt that it added to the aesthetic appeal of the shed, and while it doesn’t try to hide its plastic origins we found it fun and pleasing on the eye. One reason for this was the curved tops on the double hinged doors; it’s a little touch but one that we were glad to see, as it shows that the manufacturer Suncast has paid attention to design and appearance. Another unusual, and yet very welcome, feature of the doors is that they have a row of tiny windows running along them. These are just large enough to allow sunlight into the interior, and yet they still make it difficult for passers by to see inside, which should make it less likely to be targeted by opportune shed thieves. We were also impressed by how strong this shed is, thanks to its blow moulded resin substrate which is reinforced by steel. The final garden storage shed in our WhatShed league table has a unique design, although it isn’t immediately obvious. 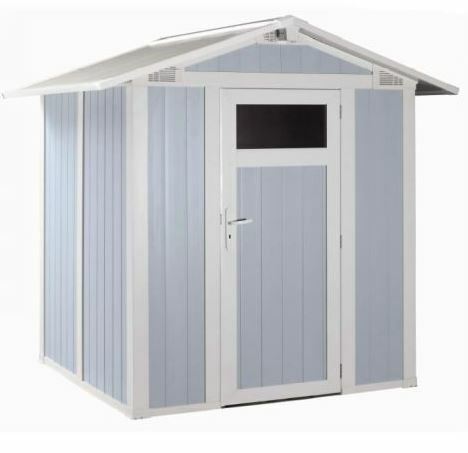 At first glance we found this to be a pent shed like many others that we review, but on closer inspection we discovered that what differentiates it is that it has not only double hinged doors at the front but also a single hinged door at the side. This means that when all the doors are open it looks as if the shed itself has folded out, and it’s incredibly easy to move items in and out. If you plan on storing large or wide items then this could prove to be a very useful feature. We were also pleased to find that this door can be positioned on either end of this garden storage shed, so it can be adapted to fit each individual garden. A 10 year guarantee has been provided by the manufacturer, although this is dependent upon the owner adding a yearly wood preserver treatment. On a shed as compact as this, however, that shouldn’t be too costly or time consuming a task. This is a shed with a lot to offer then, but we have seen cheaper sheds of a similar size that have more traditional good looks, and so this is reflected in its overall position within our league table. This is one of the most attractive storage sheds that we’ve seen, in any substrate, and it belies the image that some people have when they think of a plastic clad garden storage shed. 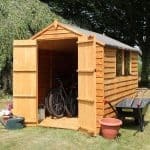 We’ve come to expect innovative and exciting looks when it comes to the Grosfillex range of sheds, and we were pleased to see that this smallest shed within their range, with a base area of around six foot by five foot, lives up to their big reputation. What we liked most about it was the pastel blue colour scheme, with nicely contrasting white trim; it’s subtle and yet we feel it’s sure to attract compliments from all who see it. The other design features that really caught our eye when we saw this garden storage shed were the overhanging roof which gives added protection against rain and sun on all four sides, and the small rectangular window at the top of the door. It’s something we don’t often see on a plastic shed, and as practical as it is attractive. 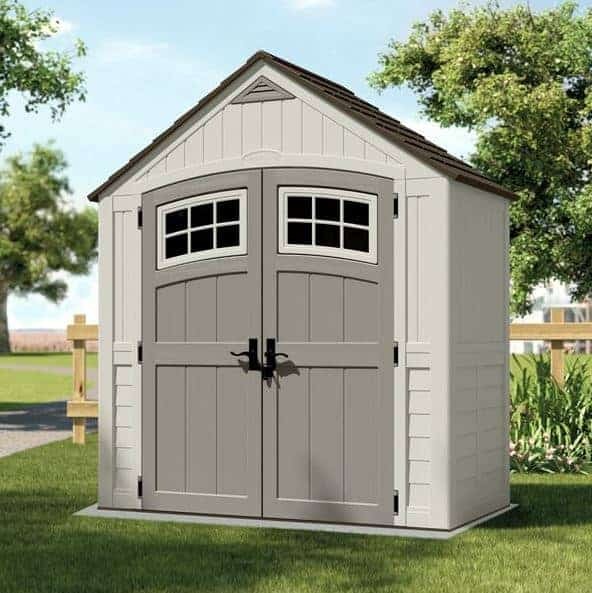 With a 10 year warranty included, and the likelihood that this tough shed will actually last much longer, only the high price tag stops this from being placed much higher up our league table of the very best garden storage sheds that can be purchased online. When we review Duramax sheds we always find them to be tough and reliable, which is one reason that they take two places in this garden storage shed league table. What differentiates this from the model that we looked at earlier, besides its six foot by six foot storage area, is that it has chocolate brown coloured double doors rather than being all white. This instantly caught our eye, but what we liked most about the doors is that they create a very wide opening. This will come in especially useful to keen gardeners who will be moving items in and out on a regular basis using a wheelbarrow. Yet another feature of the doors that we liked is that they are very easy to install. Double hinged doors such as these can often be one of the most fiddly components on a garden storage shed, but these are supplied pre-assembled and simply hook onto hinge pins that are also already in place. 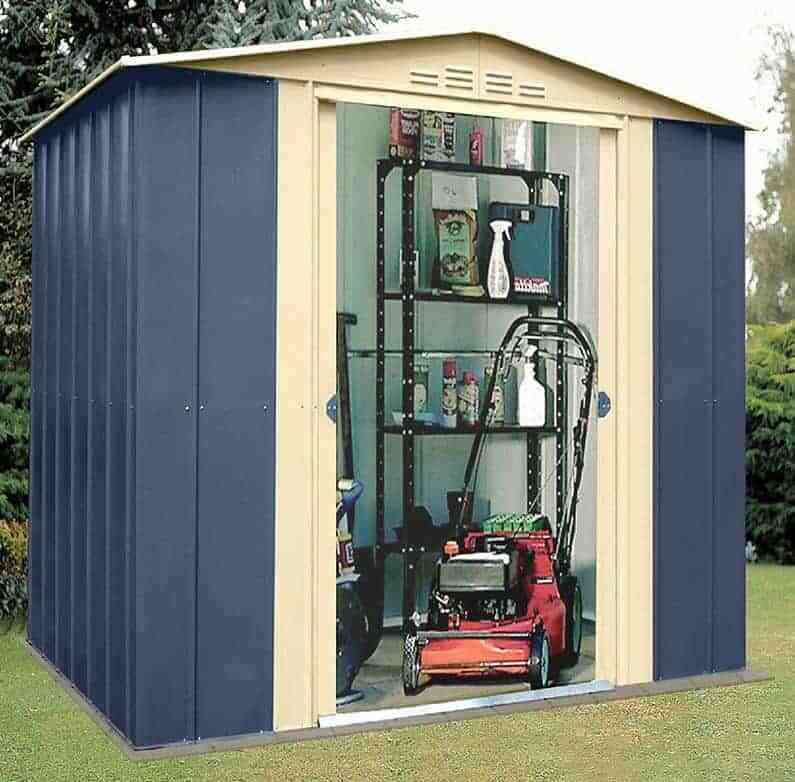 It makes the installation process as a whole simple and straight forward, so this would make a good purchase for someone who is new to the world of shed assembly and installation. It also comes with a substantial price tag of over five hundred pounds, however, which is why it has to be content with the final position in our league table.